Power Star Pawan Kalyan, chief of Jana Sena is extremely busy going on a state wide tour in Andhra Pradesh highlighting the failures of the ruling TDP and his opposition rivals and is now getting ready to go on a tour of Telangana. 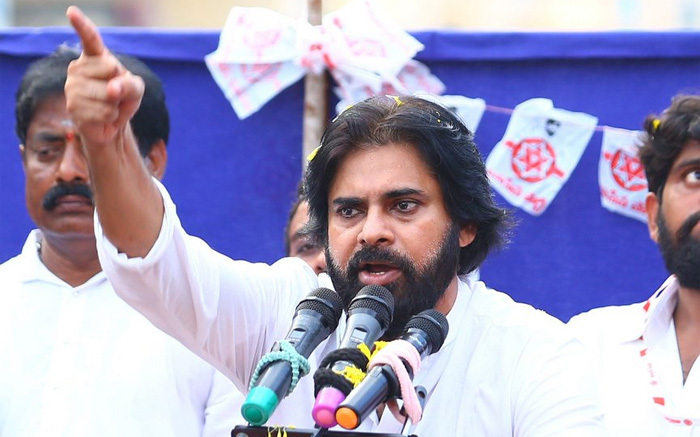 Pawan is galvanizing his supporters and fans with his ferocious and aggressive speeches. He shocked all by making sensational claims that three influential people hatched a conspiracy to murder him. In the midst of all this, Pawan Kalyan suffered an eye injury. Inside talk is few fans and cadre of Jana Sena threw flags and towels in their excitement when Pawan addressed them in Denduluru. Few of them hurt his left eye and injuring him in the process. According to sources, doctors examined him and asked him to take few precautions. Wonder when enthusiastic fans and supporters will realize that in their enthusiasm they are putting the life of their beloved leader in risk of injuries.